All that glittered was not gold, nor platinum, at Motown. Yet as this Brenda Holloway biography shows, the soul singer dazzled anyway, and early on. On June 21, 1946, Brenda Holloway came to be in Atascadero, California, but spent her childhood in Los Angeles, in Watts. Through violin and voice, in church and with her younger sister Patrice, Brenda's incandescent musical gifts first took form. If word hadn't already spread about her before she joined the future Whispers, it had by the time she sang backup with lead Patrice on a local recording--Brenda's first at age 14. Los Angeles at large also let the girls liven up various sessions with their valuable vocals. 1964 was the year Brenda broke out of the crowd. After catching wind of a DJ convention in the city, she morphed from kitchen-mopper to event-crasher. With her mother, a friend, and a taut gold pantsuit, her audacity and sparkle screamed "star!" One DJ was so convinced that he summoned her onstage. She sang ("My Guy"), Berry Gordy heard (and saw), and she signed (with Tamla) as his first West Coast singer. 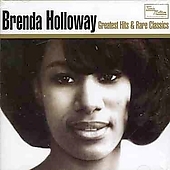 The Motown chapter of the Brenda Holloway biography (and discography) starts nicely with "Every Little Bit Hurts." The company's earliest L.A.-based single beamed the artist up the pop and R&B charts and inspired her first full album. Even the Beatles sensed her soulful brilliance through their shag haircuts! Brenda Holloway received another onstage invitation in 1965, this time as the opener for the rock band's U.S. tour. Motown-style R&B remained her forte--as she declared in one hit, "I'll Always Love You"! ;) With Smokey Robinson behind "When I'm Gone" and "Operator," the company made sure her songs radiated as much lyrical pathos as heat. The saying, "Out of sight, out of mind," might have applied to Brenda Holloway. When Motown nixed her Hurtin' and Cryin' album, the commuting distance between L.A. and Detroit felt a little more burdensome. Yet it did help her avoid the hard partying of her company colleagues. Brenda soon turned to her sister and a more comfortable endeavor: songwriting. 1968's "You've Made Me So Very Happy" did just that, but more successfully as a remake for Blood, Sweat & Tears than as the R&B original. Brenda Holloway proved adept at adaptation, too, when she, among other singers, replaced an ailing Tammi Terrell in concert with Marvin Gaye. But overall, her fashions flashed more brightly than her career. This Brenda Holloway biography can boast about only a second album, The Artistry of..., before the singer quit the music industry that same year (1968). Motown's lax promotion and her peers' lax lifestyles didn't make the experience ideal for her. True to her intentions, Holloway wed a minister and stayed away from the lights. She re-emerged with a Brand New gospel album in 1980, but didn't regain her old groove until a Motorcity stint in 1987. When the artist whose song she boldly covered pre-Motown--Mary Wells--died in 1995, Holloway sang live again in L.A. and the U.K., sometimes with other soul souls like Brenton Wood and Kim Weston. Volt recharged her recording career in 1999 with It's a Woman's World. Brenda Holloway has mellowed out musically with more slow jams than rough R&B cuts. But better to still simmer today than to have burned out far in the past. Can't go on without more Motown oldies singers after this Brenda Holloway biography? Perhaps the homepage can give you all the bios that you want now.